Ted Cruz Endorses Trump Despite Bitter Rivalry | Democracy Now! FBI chief: Extreme concern about fanatics from Syria, Iraq - U.S.
WASHINGTON — Law enforcement and intelligence agencies remain extremely concerned that violent extremists will eventually flow out of Syria and Iraq and into other countries in hopes of committing attacks, FBI Director James Comey told Congress on Tuesday. Law enforcement and intelligence agencies remain extremely concerned that violent extremists will eventually flow out of Syria and Iraq and into other countries in hopes of committing attacks, FBI Director James Comey told Congress on Tuesday. Trump’s barb came after Clinton bragged that she had “traveled to 112 countries” during her years as secretary of state. The short ad from Future 45, a conservative Super PAC, works to prove Trump’s point by laying out the laundry list of failures that were produced during her travels around the world. The ad uses Clinton’s infamous “what difference does it make” phrase during her Benghazi testimony to say that there is little difference between Clinton and Richard Nixon, who was forced to resign the presidency in 1974. The post New Ad Slams Hillary Clinton’s ‘Bad Experience’ appeared first on Washington Free Beacon. National security and cyber threat experts wrote a letter to the Pentagon urging the secretary of defense and chairman of the Joint Chiefs of Staff to intervene so that the United States doesn’t lose control of the Internet on Oct. 1. Currently, the National Telecommunications and Information Administration has authority over the Internet’s domain name system through a contract with the Internet Corporation for Assigned Names and Numbers, otherwise known as ICANN. The contract is set to expire on Sept. 30. The experts end the letter urging the Pentagon to impress upon President Obama that the contract should not be terminated at this time and that the decision should be delayed. The post National Security Experts Write Letter Urging Pentagon to Oppose Transfer of U.S. Control of Internet appeared first on Washington Free Beacon. 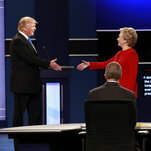 HEMPSTEAD, N.Y. (AP) - Donald Trump aggressively tried to pin the nation's economic and national security problems on Hillary Clinton in the first presidential debate, belittling the former senator and secretary of state as a "typical politician" incapable of delivering the change many Americans crave. — underscore that homegrown attacks inspired by violent extremists are as much a threat to the United States as those directed by terrorists, the nation's Homeland Security chief says. Less scoping with its all-seeing eye than apparently shooting itself in the foot, the NSA gets another battering in this intriguing but troubling documentary, released in the slipstream of Oliver Stone’sSnowden. It’s a tale of two surveillance systems: Trailblazer, the pre-2006 digital-comms sweep that failed to anticipate 9/11, vs ThinThread, the DIY precursor developed on the downlow by former NSA technical director-turned-whistleblower Bill Binney. A crack analyst who pioneered the concept of meta-data (“the data about the data”), Binney is a conduit for a fascinating run-through of postwar intelligence-gathering, starting with the 1968 Soviet invasion of Czechoslovakia, which he claims he predicted. Yet lambasting rival security factions for their incompetence and cronyism, while compacting bigger issues about privacy and democracy, A Good American is in danger of coming across like an NSA internal review. Rather than adversarially pinning him, it cheerleads Binney as a homespun American mathmo maverick bucking big government. At one point he says of his methodology: “You never ask for permission, only forgiveness.” In the film, as in real life, the crucial questions are posed too fleetingly too late. A key priority of Hillary Clinton’s proposed intelligence surge will be to kill or capture Islamic State leader Abu Bakr al-Baghdadi, her campaign has told the Guardian. During the past year, Clinton, the former secretary of state and Democratic presidential nominee, has placed bolstering the vast US intelligence apparatus at the center of her national security agenda. said the punishment would like exacerbate Ms. Manning’s problems and would be appealed. For Beijing, befriending the Philippines’ new president, Rodrigo Duterte, trumps building a military base 150 miles from the country’s coast. The Assad regime and Russia intensively bombarded the Syrian city of Aleppo for the fourth day in a row yesterday, while Moscow and the Syrian Government appeared to harden their position that the US and its partners caused the US-Russia-brokered ceasefire to disintegrate last week, the New York Times’ Rick Gladstone and Somini Sengupta report. The ceasefire deal “is not dead yet,” Syrian Foreign Minister Walid al-Moallem said in an interview broadcast yesterday, Noam Raydan reports at the Wall Street Journal. The Obama administration will “hotly condemn the assault on Aleppo, but do absolutely nothing to stop it,” suggests the Washington Post editorial board. If recent claims that Russia is using bunker-buster bombs in Aleppo are true it would mark a new, more destructive phase in the Russian assault on rebel forces there, and would mean that a diplomatic route to peace in Aleppo is closed, Patrick Wintour suggests at the Guardian. The US special envoy to Syria was told the Syrian government intended to hit the Aleppo facilities of the White Helmets volunteer rescue group two days before the aerial attacks, Michael Weiss reports at The Daily Beast. The “war of words” between Russia and the West over Syria is the worst since the Cold War, Cassandra Vinograd observes at NBC News. Saudi Arabia is enlisting major US companies to make an economic case against the bill, Isaak Arnsdorf and Seung Min Kim report at POLITICO. US Deputy Secretary of State Anthony Blinken arrived in Ankara today for a series of meetings with Turkish officials to discuss bilateral and strategic issues including cooperation in the fight against the Islamic State, the Hürriyet Daily News reports. Turkey’s post-July 15 coup crackdown has extended into the heartland of the Kurdish minority, writes Emre Peker at the Wall Street Journal, President Erdoğan saying the recent suspension of 11,285 teachers and the removal of 24 elected mayors for allegedly supporting Kurdish separatists are part of the biggest operation yet against the PKK. Turkish authorities have issued warrants for 121 people as part of the ongoing investigation into the July 15 failed coup, including directors of a charity linked to Pennsylvania-based cleric Fethullah Gulen, reports the AP. Pakistan continues to believe cross-border terrorist attacks will allow it to obtain territory it covets in Jammu and Kashmir, India’s foreign minister claimed before the UN General Assembly yesterday. [AP’s Michael Astor] Pakistan has branded the speech a “litany of falsehoods,” reports Al Arabiya. India’s armed forces are closely monitoring the situation on India’s border with Pakistan and is ready to respond to “any situation,” India’s Director-General of Inter-Services Public Relations told journalists after an operations and security review meeting today, reports DAWN. The US filed criminal charges against four Chinese nationals and a trading company based in China for violating US sanctions against North Korean companies that help Pyongyang develop nuclear weapons, the Justice Department confirmed yesterday. There is skepticism inside US intelligence agencies that North Korea truly intends to plant a flag on the moon, its explanation for the testing of a rocket engine last week. David E. Sanger and William J. Broad consider the possible “darker aim” of the test at the New York Times. Almost three times as many of Hillary Clinton’s unreleased emails could be made public as a result of a Freedom of Information Act lawsuit by Vice News journalist Jason Leopold, the Hill’s Katie Bo Williams reports. The Franco-German plan to bolster EU defense is “not only strategically empty and internally contradictory, but an invitation for another shove against the West by a Russia that sees it deep in a rut of passivity,” reflects John Vinocur at the Wall Street Journal. The Pentagon is committed to correcting decades of shortchanging its nuclear forces and has earmarked $108 billion for sustaining and improving nuclear forces over the next five years, Defense Secretary Ash Carter said at a nuclear missile and bomber base in North Dakota yesterday, Al Arabiya reports. Two Afghan soldiers with suspected links to the Taliban killed up to 12 of their comrades while they slept in an outpost near the northern city of Kunduz, officials said today. Sadar Razmal reports atReuters. Colombian President Juan Manuel Santos and FARC leader Rodrigo Londoño signed a historic peace accord yesterday in a ceremony held in the city of Cartagena attended by US Secretary of State John Kerry, UN Secretary-General Ban Ki-moon, Cuban President Raúl Castro and other heads of state, Nick Miroff reports at the Washington Post. A Californian man convicted of attempting to join the Islamic State in Syria was sentenced to 30 years prison yesterday, the AP reports. A visit by the Philippine special envoy to China tasked with rebuilding ties between the two countries has been canceled, his aides said today. [Reuters’ Manuel Mogato] Philippine President Rodrigo Duterte said he intended to open trade alliances and offer land leases to China and Russia, on the “other side of the ideological barrier” from his ties with the US, it was reported yesterday by Theresa Cerojano at the AP. Islamist Ahmad al-Faqi al-Mahdi was convicted sentenced to nine years in jail for destroying historical sites in Timbuktu during Mali’s 2012 conflict today, reports Anthony Deutsch at Reuters. Violent extremism has been exported by other nations into Kosovo, its foreign minister said yesterday. Kosovo has seen a greater percentage of its citizens fight for the Islamic State group than any other European nation, reports the AP’s Alina Heineke. Joint naval exercises between Russia and China in the South China Sea last week show the two nations are increasing cooperation on a common strategic purpose, to push the US out, according to the Wall Street Journal editorial board. The first direct face-off between the two US presidential candidates Tuesday, Sept. 27 ended in a slight edge for the Democrats’ Hillary Clinton versus Republican Donald Trump. But the score was not decisive enough to radically change the close tie prevailing in the polls when the contenders took the stage. They still face two more debates on Oct. 9 and Oct. 19 before their final round - the Nov. 8 election for president. Clinton grabbed the advantage by sustained attacks, when she was sharp, focused and personal. In laying out policy she was a lot less pointed, offering the voter no new or exciting ideas. Here her robotic aloofness came into play. Trump, in contrast, spent the entire 90 minutes largely on the defensive against Clinton’s assaults – chiefly on race and his failure to publish tax returns. He was most vigorous when he accused President Obama and Clinton, as secretary of state, of creating the vacuum in which ISIS was formed, and never stopping its spread to 130 countries. However, his lack of political experience showed at points when he should have hit back or hammered his opponent, such as on her private server, emails and her murky ties as Secretary of State with the Clinton Foundation. On those points, he fell back, showing weakness, and let her get away. The next round of polls will indicate whether or not the debate changed the balance between them. An Israeli moment came up over the nuclear accord with Iran, which Trump attacked as a bad deal, when Clinton claimed that Iran was just a week away from a nuclear bomb. This disclosure finally laid to rest the argument in Israel at the time by opponents of a military attack against Iran’s nuclear facilities that Iran was still two years away from a nuke. That false argument proves to have been advanced as part of a concerted political campaign against the Netanyahu government. Up until the first presidential face-off with her rival, Democratic presidential candidate Hillary Clinton was unable to reverse the upward momentum in the polls of her rival, Republican nominee Donald Trump. Even after spending $60 million on her campaign, making countless clever, authoritative speeches based on her long experience at the forefront of American politics, she was unable to decisively prove to the American voter that Trump is unfit to serve as president and their commander-in-chief. Neither could her campaign staff solve the mystery that the more she and her supporters attacked Trump, the more he gained in popularity. The first of their three debates at Hofstra University in Hempstead N.Y. ranked as the greatest show on earth by TV audiences in every world time zone. Clinton saw it as her big chance to leap ahead and break out of the dead heat with her rival – app. 46 pc each in the polls and a tie emerging Monday among state electors. Where the gap between them stood out most strikingly was on the social media, on which Trump won an audience of 11.5 million compared with Clinton’s 7.5 million. Another gap proved easier to bridge: The podium for the debate, moderated by NBC's Lester Holt, was adjusted to lift Clinton’s 5 foot 4 height closer to Trump’s 6 foot 2. There is plenty of controversy over whether or not the confrontational debates between the leading contenders actually determine the outcome of the Nov. 8 presidential election, or even what finally decides the majority of voters to come down for one candidate against the other. But likeability, trustworthiness and temperament – how each of the two contenders comes across to the voter - – may this time, more than ever before, be the decisive factor in determining whether the Trump momentum persists or Clinton manages to turn the tide in her favor. The next debates are scheduled for Oct. 9 and Oct. 19. Trump has the advantage of an experienced TV showman and a larger-than-life personality; Clinton is a smooth talker with facts and issues at her fingertips from long stints in politics as first lady, senator and Secretary of State. Clinton preaches stability and the continuity of globalist policies, when this ideal has sunk the middle class in many Western countries, not just America, and the hunger for change is strongly evident. She also claims she knows how to fight terrorism from personal experience in government. “I was there” in 2011, when American elite troops execute Osama Bin Laden, she says. But seven years later, an Al Qaeda terrorist, Ahmad Khan Rahami, set off bombs in Manhattan. Trump, for his part, may go on at length about making American great and building a wall to keep illegal immigrants from stealing in from Mexico, but it is becoming more and more obvious that his real goal is to upend the ruling political system in the United States. He is most convincing when, in his broad New York accents, he murders “political correctness” and vows to bury “the Washington culture.” If Trump is elected president - and means what he says - a great many political establishments, including national media and think tanks, will fall off their pedestals with a loud crash, and the new Trump popular movement will move in. It is no wonder, therefore, that groups who subsist from the traditional US establishments vilify him day and night. But they have encountered the same dilemma as Hillary: however tellingly they lambaste him, hit him with well-deserved criticism or expose his many shortcomings, the higher he climbs in the polls. But the real mystery will only be solved on Nov. 8, when the American voter shows whether the thirst for change is strong enough to risk backing an unpredictable, flamboyant New York business mogul for president. The Syrian army Tuesday began a comprehensive ground operation to recover Aleppo with special commando forces advancing in armored columns from three directions. Three heads are taking the main routes to the rebel-held eastern suburbs, as well as from the north and the southeast. They are backed by Syria air strikes and pro-Iranian Shiite Afghan and other foreign militias commanded by senior Iranian officers. Five years after Anwar al-Awlaki was killed by an American drone strike, he keeps inspiring acts of terror - including the Chelsea bombing. Democrats and Republicans are vowing to decisively override President Obama's veto of a bill to allow families of Sept. 11 victims to sue the Saudi government. Bombings in New York and New Jersey — and a stabbing attack in Minnesota the same day — underscore the growing threat of homegrown terrorism. Cyber threats: The need to have a 360-degree awareness of cybersecurity and the potential for attacks to come from any direction is overwhelming. Mr. Trump and his surrogates suggested that Bill Clinton’s relationship with Monica Lewinsky was fair game in the debate. HEMPSTEAD, N.Y. — Score round 1 for Hillary Clinton. That’s according to The POLITICO Caucus — a panel of swing-state activists, strategists and operatives who watched the first debate here Monday night. The insiders’ bipartisan verdict: Clinton dispatched Donald Trump in their first of three nationally televised meetings. Overall, roughly 80 percent of insiders — with equal numbers of Democrats and Republicans responding to the post-debate survey — said Clinton did the better job at the debate, including 99 percent of Democrats and 57 percent of Republicans. Only 21 percent — 1 percent of Democrats and 43 percent of Republicans — picked Trump as the winner. 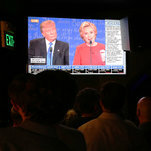 Democrats said Clinton was prepared and succeeded in provoking Trump — who began the debate speaking so quietly the audio engineers struggled to raise his volume to a comparable level in the debate hall but quickly became more animated in the face of Clinton’s attacks. Some Democrats predicted the debate would swing the momentum, which appeared to be with Trump, with public polls showing a tightening race. But a Florida Democrat countered that Clinton’s performance was unlikely to change fundamentally the trajectory of the race. “It is becoming a base turnout election, and she did a great job tonight of making the stakes in this election very clear,” the Democrat said. Among Republicans, the tally was closer — but that speaks to a divided party as much as actual ambivalence about which candidate performed better on Monday night. But there was a significant share of Republicans who thought Trump won — most of whom said Trump’s outside appeal could be the most memorable aspect of the debate. Clinton met expectations on Monday night, while insiders are mixed on Trump. Insiders were more mixed on Trump, on the other hand. Overall, 55 percent of insiders said Trump met expectations: 40 percent of Democrats and 68 percent of Republicans. But for some Republicans, meeting expectations wasn’t good enough. And a Virginia Republican said Trump did little to appeal to a key group of Republican-leaning voters whom Trump is repelling this year: white-collar whites. “He needs college whites, and he didn't connect,” the Republican said. Republicans are divided on the political impact of the debate. GOP insiders aren’t sure whether Trump is better or worse off after the Monday night debate. Asked whether Trump’s performance makes it more likely he wins the race, just 31 percent said yes — comparable to the 33 percent who said it doesn’t. A slim plurality, 36 percent, said the debate wouldn’t have a significant impact on Trump’s chances. The debate was “not fatal, but very definitely a missed opportunity,” said one New Hampshire Republican. "Neither of them made a persuasive case that they were more fit than the other to be president. At this point that advantages Trump," said an Ohio Republican. But despite — or perhaps because of — Trump’s unconventional debate style, some insiders said his message could resonate more than the pundits think in the immediate wake of the debate. “He spoke in a language that normal Americans understand,” a Virginia Republican said. And some Republicans cautioned against reading too much into the first match-up. Among Democrats, it was more decisive: 60 percent said the debate made it less likely Trump becomes president, compared to 15 percent who said it makes it more likely and 25 percent who said it wouldn’t have an impact. The Republican nominee interrupted Hillary Clinton 29 times in Monday night’s event. 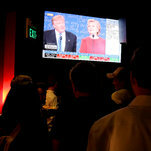 San Franciscans gathered at The Chapel in the Mission District to watch and comment on the debate. 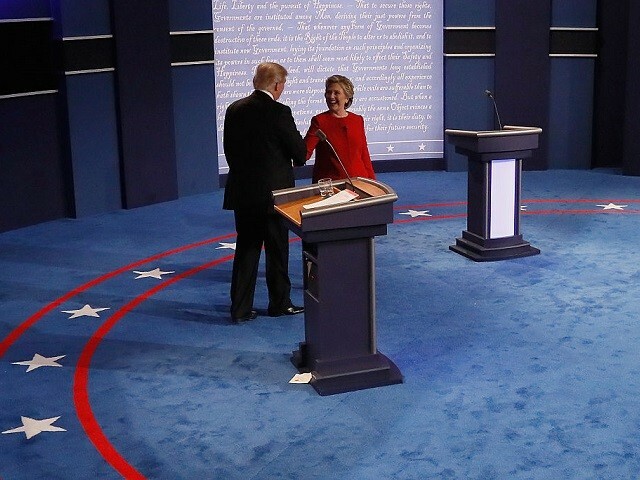 Donald Trump and Hillary Clinton at the first presidential debate at Hofstra University on Monday night. MSNBC’s Chris Hayes says he was joking about a Trump advisor telling him “We're almost 100% sure he's gonna just drop trow and moon Hillary. We're terrified." Still, it’s probably what people are thinking about as Donald Trump and Hillary Clinton gear up for their first debate later this evening. Yet, all kidding aside, both camps seem to have prepared heavily for this showdown. Kellyanne Conway, Trump’s new campaign manager, has been a godsend to the campaign, which struggled post-Cleveland. It seems that Conway has professionalized the campaign, kept it focused, and as a result—lead to Trump surging in the polls. He’s spent the preparations with his close advisers, including campaign CEO and former Breitbart News executive Stephen Bannon and campaign manager Kellyanne Conway. Key confidantes and surrogates such as Rudy Giuliani, New Jersey Gov. Chris Christie and retired Lt. Gen. Michael Flynn, as well as advisers Stephen Miller, Jason Miller and son-in-law Jared Kushner, have also taken part. Former Fox News chief Roger Ailes is also advising Trump on the debates and sending him memos but has skipped the last two debate sessions, according to the Times. On the other side of the aisle, Clinton is reportedly throwing herself into debate prep, scripting out answers with her team and holding at least one mock debate. She’s also mindful of Trump’s unpredictability — as The Hill reported this week, she’s preparing for whatever persona Trump may throw her way, including aggressive or below-the-belt attacks. Clinton reportedly won’t be satisfied calling out Trump for stretching the truth. She wants to prosecute the case that he’s temperamentally unfit for office and unhinged, two key campaign messages. As Hillary Clinton prepared to face the most unconventional candidate of her political career on the debate stage Monday night, her campaign aides engaged in a deep study of Donald Trump's personality to glean insights into how he might act, according to several people familiar with the process. At a working group session in August, Clinton advisers met with a small group hand-picked by the campaign to help shed light on the Republican nominee. The focus on Trump's personality suggests that Clinton's approach on Monday may be quite different from her strategy in past debates -- and that her campaign expects this event to be unlike any other. The aides involved in debate prep including her longtime aide Philippe Reines, who has played Trump in mock debate sessions. They conferred for hours with campaign outsiders who were asked to offer advice about Trump’s personality and temperament, according to people familiar with the meeting. The meeting lasted several hours. This is it, folks. It’s apparent that ads aren’t going to allow Clinton gain the edge over Trump; she’sheavily outspent him concerning media buys in key swing states, to no avail. The Democratic blue wall is in a fragile state, with Clinton mulling pulling out of Ohio. Guy noted it’s a rather explicit 180-degree turn from the Clinton campaign, which not so long ago was boasting about her commanding lead in the Electoral College. The debates are that last forum, where both heavily unpopular candidates could gain traction over the other. In some ways, it’s both Clinton and Trump’s debate to lose, Trump could torpedo his surge with voters, while Clinton needs to be successful in portraying the real estate magnate as unfit—and trying to bring those disaffected Democrats who have left for third party candidates back into the Clinton camp. Clinton might also try to hit Trump on his past statement that have turned out to be inaccurate, which might be a double-edged sword since Clinton has lied about her emails, which has proven to be one of the Achilles’ heel for her campaign that could be re-litigated in front of 100 million people. Dominique Moïsi is founder of and senior adviser to the French Institute of International Affairs. A regular writer for the Financial Times and Foreign Affairs and a visiting professor at Harvard University, Moïsi talked with Zócalo about his latest book, The Geopolitics of Emotion, and why fear, humiliation, and hope are changing our world. Q. What is the argument you make in your book? A. The book’s main argument is that you cannot fully understand the world we live in without trying to integrate and understand its emotions, in particular three of them, fear, hope and humiliation. These three emotions are closely linked to the notion of confidence, which is the defining factor in how nations and people address the challenges they face as well as how they relate to one another. If one wanted to summarize these three emotions with three formulas, one would say that hope is “I want to do it, I can do it, and I will do it”; humiliation is “I can never do it” and may lead to “I might try as well to destroy you since I cannot join you”; and fear is “Oh, my God, the world has become such a dangerous place; how can I be protected from it?” Fear, humiliation, and hope thus can be seen as just natural and vital ingredients in human beings as the three components of blood; red cells, white cells and plasma. Health depends on the right balance among them. To have too much or too little of any of these three components is dangerous for the balance of the body and for its long term health. The key point is that emotions are like cholesterol, both good and bad. Q. Samuel Huntington’s Clash of Civilizations thesis still holds much weight in the political world. Where do you think it falls short, and how does your analysis better capture the realities of today’s global conflicts? A. In his famous 1993 essay in Foreign Affairs, which he later turned into a book, Samuel Huntington claimed that a clash of civilizations was about to dominate world politics, in which culture, alongside national interest and political ideology, was becoming a geopolitical fault line. I have always had serious reservations about Huntington’s theory. I think that in his search for a new enemy in order to focus the foreign policy of the United States after the demise of the Soviet empire, Huntington dangerously confused the notion of culture in general, including social and religious beliefs and behaviors, with that of political culture. Are not many in the Asian world also believers in the universal applicability of Western values and practices such as democracy? There also seems to be no sign of an alliance between Asia and the Islamic world against the West, as Huntington predicted. On the contrary, in the international arena, India and China behave more like satisfied status quo powers – with the exception of Taiwan and Tibet for China, and Kashmir for India – than irresponsible and dangerous revolutionaries. Q. How do these emotions – fear, humiliation, hope – come to dominate a culture? What are the factors that determine them? A. Like the seasons, emotions are cyclical. These cycles can be long or short, depending on the culture, on world events, on economic and political developments. In our modern world even a major sports victory can create a sense of elation that may be short lived but have serious immediate consequences. The Chinese banked on the 2008 Beijing Olympics to confirm the international status of their country, even if the Olympics are the result and not the cause of this status. Hope has not only moved east but has also taken on a materialist secular overtone. Hope today is about economic and social empowerment, and it is based on a sense of confidence which is the product of history. As long as the sense of progress among the rising millions transcends the despair, anger and hunger of the poor majority, then the culture of hope will prevail in China, India, and not only there. If hope is confidence, humiliation is impotence, an emotion that stems above all from the feeling that you are no longer in control of your life either collectively as a people, a nation, or a religious community, or individually, as a single person. Humiliation peaks when you are convinced that the “Other” has intruded into the private realm of your own life and made you utterly dependent. Humiliation encapsulates a sense of dispossession toward the present and even more so towards the future. The dominance of humiliation in the Arab-Islamic world has many causes but the first and most important is a sense of historical decline, a fear of decay that can be traced back to the end of the 17th century, but which reached new depths in the last century. Q. You open the book with a discussion of American hope, and you also discuss American fear within the book. How do these two emotions live side by side in America? What sort of country and conflict does that create? A. Fear and hope coexist in America. One could say that there is one America united by fear and another united by the fear of fear and that the latter America has rallied under the banner of hope. Fear has always been present in American history. The free circulation of guns that remains characteristic of the United States to this day not only celebrates individualism and self-defense, but also represents the inheritance of a wild, violent, and dangerous past, where “man is wolf to man” and fear a natural part of life. But America is also the land of hope and dream. President Barack Obama has this on his side; he is striving not against but with the national grain, seeking not to innovate but rather to restore his country’s traditional view of itself, in which a strong belief in ethical values produces a healthy sense of optimism. One of the key reasons for optimism is that America, the quintessential nation of immigrants, will find new energies and transcend its fears thanks to the millions of new citizens arriving on its shores every year. No one in the world dreams of becoming Chinese; millions of people still dream of becoming American. As long as America keeps the power to attract and the power to integrate, she will be able to surmount the tension between fear and hope. Q. You note that some countries exhibit a combination of the three emotions – Russia, Iran, Israel. What does this do to their country and their relationships with other countries? Are they uniquely conflict-prone, or unstable, or extreme, or something else? A. Countries like Russia, Iran and Israel elude a simple classification because they contain all three emotions – fear, humiliation and hope – equally or in a deeply intermingled proportion. They tend to be particularly difficult to deal with. Of course each country is a case in itself and their attitudes will vary with time depending upon their choices of leaders. Suffice it to say that the least at ease you are with yourself, the more difficult you tend to be in your relationships with others. Q. How can the emotion of humiliation in the Arab-Islamic world be overcome, if at all? A. Humiliation can be overcome. Flashes of hope do exist in the Arab world. Just consider the case of the Gulf emirates. They constitute a zone of prosperity and stability in an otherwise poor and turbulent environment and they are the proof that modernity and Islam are not incompatible. Q. You note that some believe clash between the West and the East are inevitable. Are clashes between countries or cultures exhibiting different emotions inevitable? A. Clashes between countries and cultures exhibiting different emotions are not inevitable. Knowledge is the answer to intolerance. Learning about the emotions of other cultures is crucial in a world where the “Other” becomes part of us in our multicultural societies. Self-knowledge is particularly important in the case of Islam, where ignorance of one’s own religion and culture constitutes the most fertile soil for the most extreme interpretations, radical perversions and the teaching of hatred. Q. What is the ideal emotional state for countries, and/or for the world, going forward? A. If collective entities like cultures and nations can be analyzed through the prisms of psychology and emotions, is it possible to conceive of a prescription for the world analogous to the medical treatment that might be prescribed for an individual? In other words, what are the political strategies and institutional mechanisms necessary to reinforce hope and to contain or reduce fear and humiliation? I am afraid you will have to wait for an answer; this is the subject of my next book. *Photo of Mr. Moïsi courtesy Laurent Moïsi. A common diagnosis of Jeb Bush's failed campaign is that the candidate was "out of touch." It's hard to argue otherwise; Bush himself admitted it. "I'm not a grievance candidate," he told NBC's Chuck Todd. Sure enough, Bush soon wasn't a candidate at all. There are no more happy warriors on the hustings, eager to lead the richest, most powerful nation on Earth. Well, there's Ohio Gov. John Kasich. "I want you to know I'm going to continue to run a positive campaign and not get down in the gutter and throw mud at anybody," Kasich said after his defeat — one of 30 out of 30 Republican contests — in Michigan. "So I think the people are beginning to reward a positive campaign." It has been 22 years since "angry white men" powered the Republican takeover of Congress. Over the decades their anger and alienation have only intensified as their dissatisfaction has spread across the land. More than twice as many Americans believe the country is on the wrong track as on the right track. That's a subjective judgment, but it rests on facts people often get wrong. The 2015 American Values Survey found: "The number of Americans citing crime, racial tensions, and illegal immigration as major problems increased substantially between 2012 and 2015." Actually, crime, including violent crime, is mostly down in that period, continuing a spectacularly positive trend that is two decades long. Illegal immigration is down substantially from its 2007 peak. Racial "tensions," which are a product of perception, may well be "up" for some Americans. But since 2012, jobs, GDP growth and the number of Americans with health insurance are all up despite many perceptions that they're not. In a world increasingly driven and navigated by data, American politics appears increasingly immune to its charms. Donald Trump's voluminous lies have been repeatedly documented and refuted, yet he leads the Republican nomination race. Demonology and nonsense reign. "What most Republicans know about the society and the economy comes from cable news, talk radio, right-wing blogs and the amplification from emails and other social media shared by close friends and relatives," political scientist Norman Ornstein said via email. "What is the most prevalent commercial they see? For gold! Why gold? That is what you buy when the Apocalypse is coming." On the Democratic side, life ought to be relatively cool and bright. The Democratic Party has its problems, but it's not a steaming existential mess like the GOP. Hillary Clinton is running for Obama's third term, promising both to preserve his accomplishments and, where possible, advance a similar agenda. Like Obama campaigning in 2012, when he had the delicate task of taking credit for an economic rebound while acknowledging that many skiffs had failed to rise with the tide, Clinton is constantly reminding audiences that she knows things should be better. But to keep pace with Bernie Sanders, her Democratic rival, she's also had to get acquainted with the gloom. The essence of the Sanders campaign is that the economy is "rigged" by those at the very top who are keeping everyone else down. Politics in his view is a wholly owned subsidiary of corporate elites. "The real issue is that Congress is owned by big money and refuses to do what the American people want them to do," Sanders said. Sanders doesn't consider Obama's presidency a liberal success under extraordinarily adverse economic and political conditions. He thinks it's a lost opportunity. He and his supporters see a bleak landscape raked over by corporations and their political enablers in pursuit of dominance and profits. They want more jobs and less trade, more health insurance and less Obamacare, more equality and less equivocating. Sanders' list of bad guys (the rich) is short. Republicans, by contrast, offer a smorgasbord of enemies, including Mexicans and Muslims, Obama and liberals, "political correctness," China, Japan, Europe and, of course, that locus of taxes, regulation and irredeemable evil, the U.S. Government, aka "Washington." There are serious problems in the U.S., including a long, painful decline in incomes for high-school graduates and others in jobs that have been squeezed by globalization and automation. Millions of people have been left behind by a fast-moving, unstable economy. But the general contours of the economy and the nation circa 2016 are insufficient to explain how so many Americans came to have faith in a narrative of doom. The resulting paralysis undermines the capacity of politics and policy to use traditional levers, including the tax code and the social safety net, to address the very problems bringing everyone down. One of Americans' most telling anxieties is the pervasive fear that they or a loved one will fall victim to a terrorist attack. For the average American, the chances are smaller than minuscule. But we are a nation seemingly hooked on fear itself. Mexican or Muslim, overbearing rich or grasping poor, we'll get a fix wherever we can find it.